Below are the top biotechnology stocks to watch over the coming days and weeks. Keep in mind that these stocks do NOT meet the stringent requirements for stock picks in the Premium service. Biotech stocks and IBB is lagging behind the S&P 500 which means there’s more value to be found in IBB right now. Biotechs are lagging behind the S&P 500. Biotech stocks overshot the performance of the S&P 500 in early 2019 but have been consolidating since mid-January while the S&P 500 has continued to rise. If we go back to the December 24, 2018 low, biotech stocks are leading the S&P 500. Biotechs have been consolidating as the S&P 500 catches up. EDSIVO for Vascular Ehlers-Danlos Syndrome. The PDUFA date under priority review is set for June 25, 2019. Back on December 26, 2018, Acer Therapeutics announced that the FDA had accepted for review Acer’s New Drug Application (NDA) for EDSIVO™ for the treatment of vascular Ehlers-Danlos syndrome (vEDS) in patients with a confirmed type III collagen (COL3A1) mutation. The FDA also granted a priority review of the NDA and assigned a Prescription Drug User Fee Act (PDUFA) target action date of June 25, 2019. Priority review is a designation granted by the FDA to accelerate the review process for drugs that offer a significant improvement in treatment or provide treatment where no satisfactory alternative therapy exists. Ehlers-Danlos Syndrome (EDS) is a group of hereditary disorders of connective tissue. vEDS is the most severe subtype where patients suffer from life threatening arterial dissections and ruptures, as well as intestinal and uterine ruptures. The average mortality is 51 years of age. An Acer-commissioned patient-finder study phenotypically identified 4,169 vEDS patients in the U.S. from an analysis of a commercially available patient claims database with data of approximately 190 million unique patient lives. Based on that information, Acer estimates the prevalence of phenotypically-defined vEDS in the U.S. could be greater than 1 in 45,000. Currently, there are no FDA-approved therapies for vEDS. Acer is advancing EDSIVO™ (celiprolol), a new chemical entity (NCE), for the treatment of vEDS based on a randomized controlled clinical study of celiprolol(1). FDA granted a priority review of the EDSIVO™ NDA and assigned a Prescription Drug User Fee Act (PDUFA) target action date of June 25, 2019. EDSIVO™ received FDA Orphan Drug Designation for the potential treatment of vEDS in 2015. Large players volume rising with a positive Twiggs Money Flow. ACER stock does not present a decent entry at the moment. Prices have been extended too far to the upside lately. For a good entry it is better to wait for a consolidation. Vyleesi (Bremelanotide) for female sexual dysfunction (FSD). The PDUFA date is extended to June 23, 2019. “2019 will be a year of investment and we are in the fortunate position that our cash flow generating products and our balance sheet can support the development of our future products; each of which has significant revenue and growth prospects because they provide innovative therapeutic solutions to patients with unmet medical needs,” added Mr. Myles. The downtrending continuation pattern and large players volume have diverged. AMAG stock presents an ok setup. Prices have been consolidating lately. There is a resistance zone just above the current price starting at $12.65. Right above this resistance zone may be a good entry. BHV-0223 for Amyotrophic lateral sclerosis (ALS). NDA acceptance announced November 25, 2018 but a PDUFA date was not given. The estimated PDUFA date is sometime in July 2019. Back on November 26, 2018, Biohaven Pharmaceutical announced that its 505(b)(2) new drug application (NDA) for BHV-0223, an investigational sublingual form of riluzole for the treatment of people living with amyotrophic lateral sclerosis (ALS), had been accepted for review by the FDA. Biohaven previously announced that the FDA granted orphan drug designation for BHV-0223 in ALS. BHV-0223 is a novel, lower dose formulation of riluzole designed to be placed under the tongue where it dissolves in seconds and is absorbed sublingually. The active ingredient, riluzole, is the only FDA-approved treatment to extend tracheostomy-free survival in people living with ALS. Figure 1: Biohaven’s Dysphagia in ALS Awareness Campaign: imagery. ALS is a progressive neurodegenerative motor neuron disease affecting nerve cells in the brain and the spinal cord in which patients experience muscle weakness, trouble swallowing and muscle atrophy that ultimately progresses to paralysis, impaired breathing and death. More than 80% of people living with ALS experience dysphagia, which is difficulty swallowing, during their disease course. The 505(b)(2) NDA submission is supported by data from multiple studies and clinical trials evaluating the bioequivalence of BHV-0223 to riluzole oral tablets (Rilutek®), as well as the safety and tolerability of BHV-0223. Key findings from the clinical program showed that sublingual administration of BHV-0223 (40 mg) achieved similar blood exposures to orally ingested Rilutek (50 mg). In these studies and trials, BHV-0223 was generally well tolerated. Patients also reported the sublingual formulation easy to use in clinical trials in which BHV-0223 was administered to patients with ALS and dysphagia. BHV-0223 is a sublingually administered, orally dissolving tablet (ODT) that makes use of the unique Zydis® ODT fast-dissolve technology. It is being developed under an exclusive worldwide agreement with Catalent. While riluzole is FDA-approved for ALS, existing formulations consist only of an oral tablet taken with water or an oral suspension (thickened liquid). BHV-0223 is designed to be placed under the tongue where it dissolves in seconds and is absorbed by the vasculature, thereby eliminating the need for swallowing. ALS is a progressive, neurodegenerative motor neuron disease that affects nerve cells in the brain and the spinal cord. The disease belongs to a group of disorders known as motor neuron diseases, which are characterized by the gradual degeneration and death of motor neurons. ALS affects approximately 20,000 individuals in the United States. Since its FDA’s approval in 1995, riluzole remains the only approved drug demonstrated to enhance survival and/or time to tracheostomy. More than 80% of people living with ALS experience dysphagia at some point in their disease course. Even mild or moderate dysphagia can lead to difficulty managing small oral boluses such as tablets through the swallowing process. The impaired ability to swallow safely puts people with ALS at risk of aspiration and its potentially life-threatening consequences such as aspiration pneumonia. Huge surge in price on Friday means its not a good entry right now. BHVN stock does not present a decent entry opportunity at the moment. Rumors circulated on Friday that the company is up for sale and a potential suitor has emerged. Prices have been extended too far to the upside. For a nice entry it is better to wait for a consolidation which likely isn’t coming because of the buyout rumors circulating. HTX-011 for post operative pain. The PDUFA date under priority review is set for April 30, 2019. Back on December 31, 2018, Heron Therapeutics announced that the FDA has accepted the new drug application (NDA) for Heron’s investigational agent, HTX-011, and has granted it a Priority Review designation. HTX-011 is a long-acting, extended-release formulation of the local anesthetic bupivacaine in a fixed-dose combination with the anti-inflammatory meloxicam for the management of postoperative pain. HTX-011 is the first and only dual-action fixed-combination product specifically designed to address both postoperative pain and inflammation in a single administration at the surgical site. The NDA for HTX-011, which was submitted on October 30, 2018, comprises data from five Phase 2 clinical trials and two Phase 3 clinical trials that included over 1,000 patients undergoing five different surgical procedures. The FDA also indicated that it is not currently planning to hold an advisory committee meeting to discuss this application. The FDA set a Prescription Drug User Fee Act goal date of April 30, 2019. The lack of large players volume and the negative Twiggs Money Flow suggests a lack of interest by market participants at this time. HRTX presents an ok setup opportunity. We see reduced volatility while prices have been consolidating in the most recent period. There is a resistance zone just above the current price starting at $25.44. Right above this resistance zone may be a good entry point. There is a support zone below the current price at $24.20, a stop order could be placed below this zone. Contepo for complicated urinary tract infections (cUTI). The PDUFA date under priority review is set for April 30, 2019. Back on January 14, 2019, Nabriva Therapeutics announced that the FDA had updated the PDUFA (Prescription Drug User Fee Act) goal date for the completion of the FDA’s review of the CONTEPO New Drug Application (NDA) from June 30, 2019 to April 30, 2019. The two-month acceleration is due to a clarification of the classification and subsequent expedited review period for the CONTEPO NDA submitted in October 2018. In addition to priority review, CONTEPO has been granted Qualified Infectious Disease Product (QIDP) and Fast Track designations by the FDA for the treatment of several serious infections, including cUTI. NBRV does present a nice setup opportunity. Prices have been consolidating lately. A pullback is taking place, which may present a nice opportunity for an entry. There is a very little resistance above the current price. New formulation of Thiola (tiopronin) for cystinuria. The PDUFA date is set for June 30, 2019. Back on November 12, 2018, Retrophin announced that the FDA had accepted for review the New Drug Application (NDA) for a new formulation of Thiola (tiopronin) in the treatment of cystinuria. The FDA has assigned a Prescription Drug User Fee Act (PDUFA) target action date of June 30, 2019. The NDA was filed by the Company’s partner, Mission Pharmacal Company, through the 505(b)(2) regulatory pathway which allows the FDA to reference previous findings of safety and efficacy for an already-approved product, in addition to reviewing findings from further studies of the product. Thiola (tiopronin) tablets are indicated for the prevention of cystine (kidney) stone formation in patients with severe homozygous cystinuria with urinary cystine >500 mg/day, who are resistant to treatment with conservative measures of high fluid intake, alkali and diet modification, or who have adverse reactions to d-penicillamine. 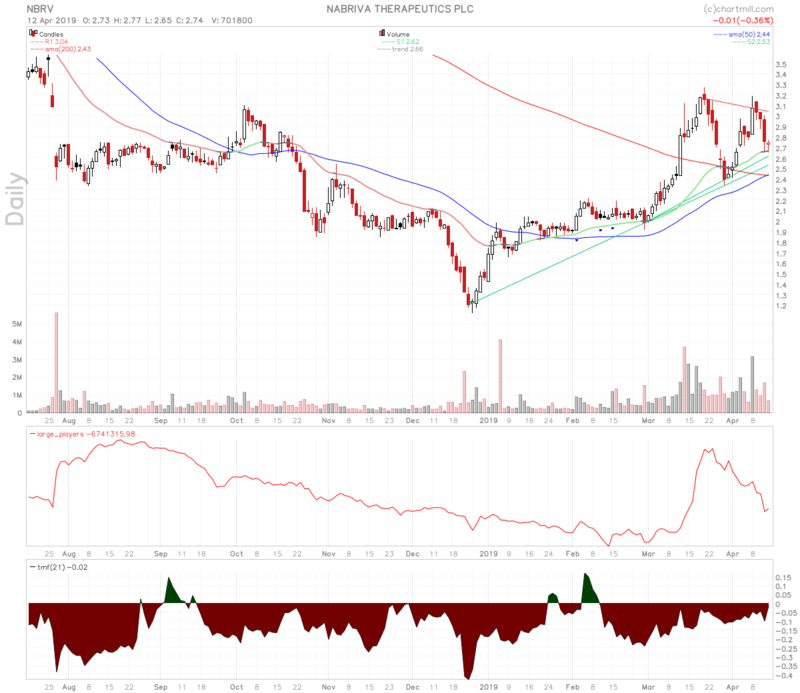 Nice uptrend continuation pattern but large players volume is a bit weak which is something to keep your eyes on. RTRX does present a good setup opportunity. Prices have been consolidating lately and the volatility has been reduced. There is a resistance zone just above the current price starting at $22.11. Right above this resistance zone may be a good entry point. Disclosure: I do not hold any position in any stocks mentioned in this article. STOCK MARKET PREDICTION SHOW OVER 26,000 SUBSCRIBERS! I am not a licensed advisor or a registered financial consultant. Alerts should not be considered as recommendations or solicitations to buy or sell any security. You assume complete responsibility for your own trades and investments. The market is volatile, and trades and investments can result in total loss of capital. I assume no responsibility for any losses. I may have positions in some stocks that are mentioned and I will disclose that when an article is published. I may liquidate these positions at my discretion without notification. My past results are not necessarily indicative of future performance. Any trades or investments are committed at your own risk. The opinions posted here are intended for educational purpose only, and I am by no means liable for any potential damages that may be incurred from this information.